If I say the words 'Russian Diplomatic Online Club' to you, where does your mind go? Somewhere pretty nefarious, right? Well in truth it's a system wherein users give the Russian Embassy in London access to their Twitter accounts, so they can use them to further broadcast the ambassador's most important tweets. It's not an uncommon practice - posting the same content across multiple Twitter accounts to boost the signal - businesses do it all the time - but when it starts getting rolled out for political influence things start to get murky. Boosting a tweet is one thing, creating the illusion of widespread support is quite another. The Russian government are known to be keen on using Twitter bots to bolster their social media presence, so in that sense a move like this isn't all that surprising. According to reports, a lot of the accounts in the 'club' were bots anyway, with nothing else showing on their accounts apart from the ambassador's tweets. Real life users still get to use their twitter as normal, it just means that every now and again the Embassy's social media team will log in and tweet for them. While it's risky enough giving anyone else access to your social media accounts, it's particularly risky now, as many higher profile Twitter accounts have been hacked even in the last few months, and hackers will often target sources who have the login details for multiple accounts. There are also likely plenty of hackers out there with a vested interest in making the Russian government look bad. Russia have already been involved in one bizarre incident in UK politics this year, when some of their bots suddenly started attacking UKIP. 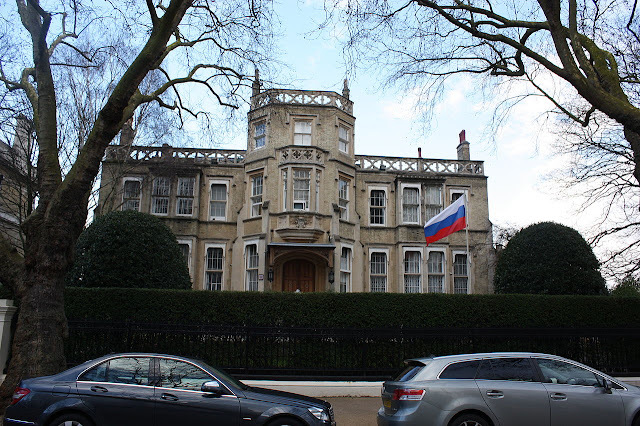 If the Russian ambassador suddenly decides he has some strong opinions about the British government, it will raise some very interesting questions.